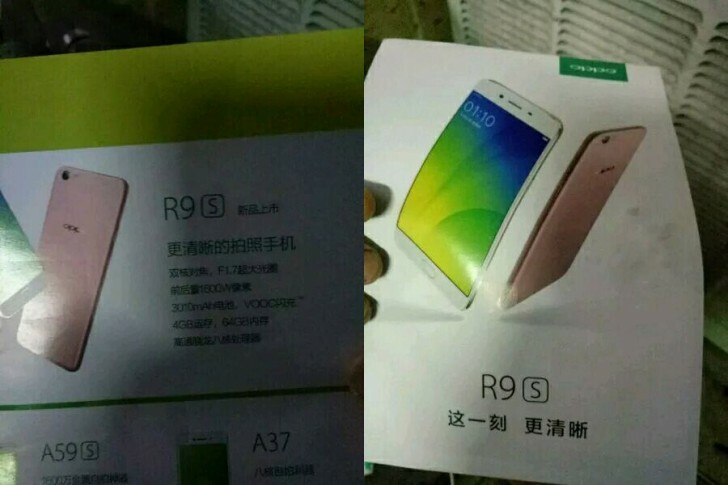 New snaps of upcoming Oppo R9S advertising leaflets have surfaced showing the phone's design. The pamphlet also confirms the R9S will feature a 3,010mAh battery, a bump from the 2,850mAh unit that was rumored so far. The handset is also said to feature the Super VOOC charging tech that Oppo showcased earlier this year, as well as an image stabilization tech powered by a new OPPO SmartSensor. Oppo R9S cleared TENAA last month in addition to China's 3C certification body. Specs-wise, from what has been revealed so far, the Oppo R9S is powered by Snapdragon 625 SoC and sports a 5.5-inch 1080p display. It would also feature a 13MP/16MP camera combo. We suspect the phone will launch some time this month, but nothing is set in stone yet. with those megapixels and PRICE, please put autofocus on the front. dont repeat the F1 series..100MP front camera without AF = OPPO.